The obvious choice of photo for this post would be a picture of Lady Gaga herself. However, I couldn't get any to load ( tech support please ). 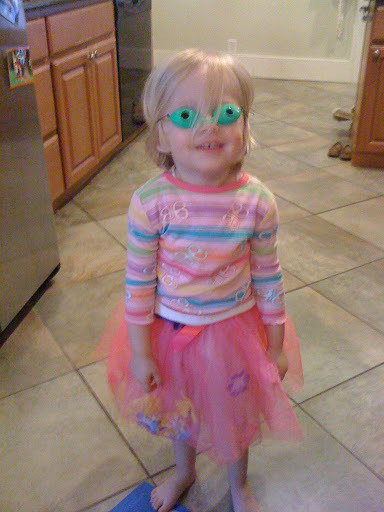 So, I choose a picture of Sophie dressed in a ridiculous outfit, much like Lady Gaga does. I have been thinking about courage lately and why it is so necessary in our lives. Some of you hate Lady Gaga, maybe some like her. I'm not endorsing her lifestyle or her music. Personally, I am not a fan of hers. But, the woman has some courage. Forbes magazine just ranked her the #1 most influential celebrity. She beat Oprah...OPRAH. No one beats Oprah...except Gaga. But, don't worry. This isn't a story about Lady Gaga. Personally, I believe that God has big dreams for each of us. We don't all need to be famous or do outlandish things...just have the courage to do what God has put in our heart. We are courageous because God is with us. He is in us. Being famous or influential doesn't necessarily take courage. Life does though. Life should take courage. If you aren't repeatedly hitting a place that you have to dig up more courage in the Spirit, then you probably aren't going anywhere. Maintaining the status quo isn't difficult. We are made to do things. Big things. Historic things. Life should take courage. We think courage is only needed for leaders or people who God has asked to do risky things. It's just not true. Anything that causes us to step out of our control of a situation and rely on God to come through is significant, a momentum builder and takes... yes, courage. Sometimes "small" things take huge amounts of courage. Forgiveness takes courage. It is risky to live in community with vulnerability. But when we risk, community is nurtured, and a group of people living in Biblical community will change the world. It always has. God's Kingdom is advanced when we respond to who He has called us to be. David didn't defeat giants fighting as Saul. He fought as himself. With a sling, rocks, and no armor. He fought as himself and he won. He had courage. I got a lot of feedback from my last post. The stories of injustice stir us all and cause most of us to be overwhelmed. Many of you felt inadequate and incompetent to make a difference. But you are not. You won't be Nelson Mandela, Ghandi, or Mother Theresa. You certainly won't be Jesus. But you are called to risk and rise up in courage. As yourself. With the weapons, personality, gifting and history that you have. When you fight as yourself, you win your battles. We walk out in courage knowing that we are not alone. You aren't the only teacher believing for his students to be changed. You aren't the only doctor believing for your patients to be healed. Not the only barista dreaming of being a CEO and funding HIV prevention in Africa. You are not the only mother of a child with special needs contending for your son or daughter. You are not alone. You are a part of an Army. A great company of men and women. A giant, loud roar of God's people crying out for more. When we walk in courage God is glorified. And isn't that the point?